I found a couple of receipts among the second batch of grandma Hazel's ephemera. The first one is dated 6/5/74. 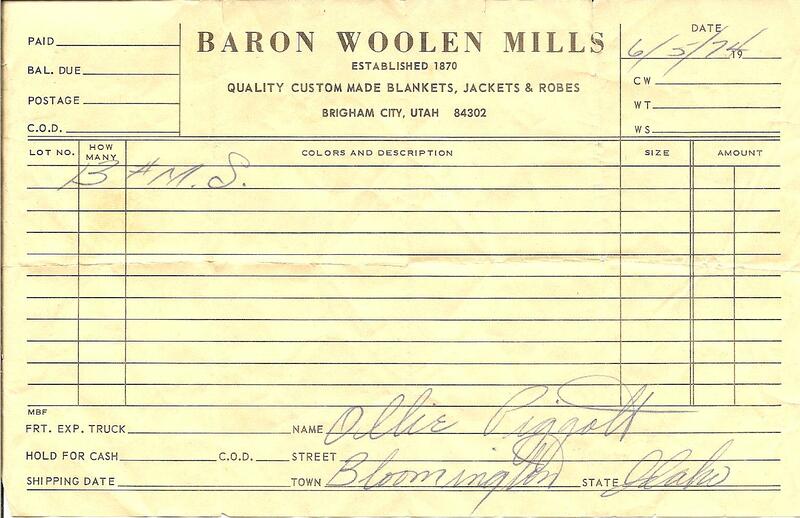 Uncle Ollie purchased or ordered 13 of the same item from the Baron Woolen Mills. I am still curious what that item was. It's probably more likely that he bought 13 blankets than 13 jackets or robes. I was curious about this company so I asked Google about it. The mill was originally built in 1869-1870, and was initially part of the Brigham City Manufacturing and Mercantile Association. 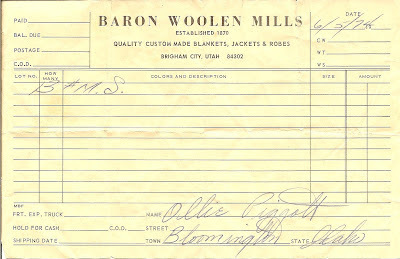 There is a wonderful history about the mill and the Baron family starting on page 116 of The Utah Historical Quarterly (vol 75, number 2, Spring 2007). Here you can find some awesome photos of some of the vintage machinery still inside the building. I also found out that the Baron Woolen Mills has a reputation for being haunted. Below is a clip from an episode of My Ghost Story. 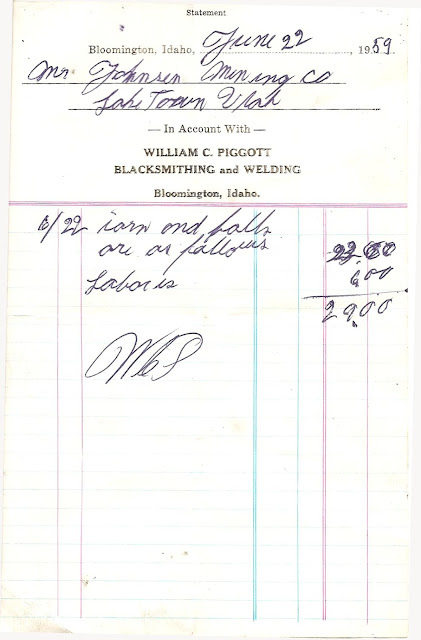 The second receipt is from my great-grandfather's Black smith and Welding business. It's dated June 22, 1959. I haven't been able to find anything on a Mr. Johnson from a mining company in Laketown, but it looks like he purchased iron a balls and gramps must have done some welding for him as well. Great post! These little artifacts can give us such interesting glimpses into the lives of our ancestors.